Exotic Bonsai only sell tools of high quality with origin Japan and Germany. The stainless tools even are guaranteed for the use of 5 years. Any additional material to maintain Bonsai in a good condition can be supplied by us upon your request. 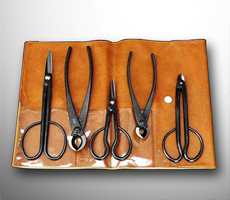 As we do not compromise with our company rules of quality you will not find cheap bonsai tools in our selling program.